Harrison kindergarteners celebrated memorial day by singing patriotic songs. In May Harrison K-8 School completed a year of challenges and growth under principal John Pavlicek and Interim Principal Domonic Carochi. The implementation of Hawk Time, a way of connecting students and staff members to teach students character and offer them opportunities to give back to their community, was quite successful. Hawk Time participants raised money for the Red Cross, supported Loaves and Fishes, and even created social media accounts as a means of combating cyber bullying. The Hawk staff also worked hard putting new literacy resources and interventions into use with fidelity, resulting in promising K-3 student growth on district benchmark tests. Staff also began participating in Communities of Practice, a professional learning community model, in an effort to work together to solve instructional and behavior issues. 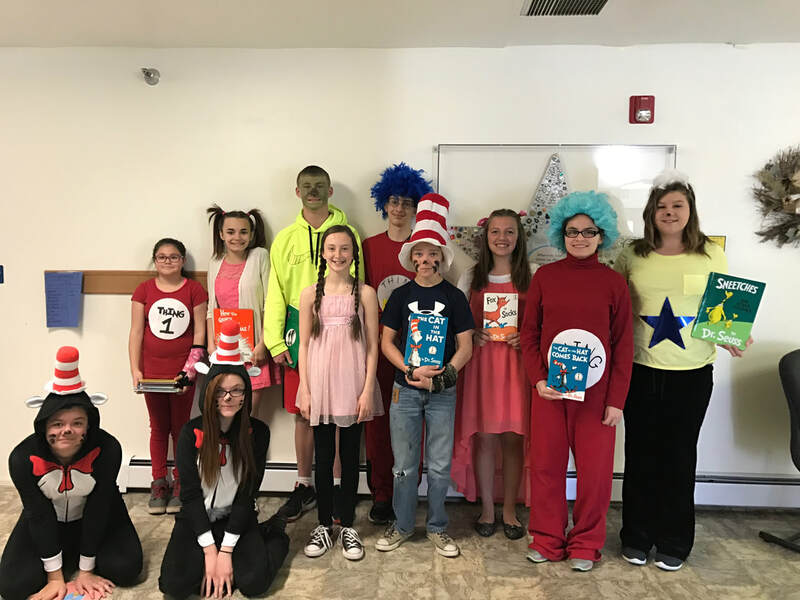 Harrison students participated in Battle of the Books. Family science night is a Harrison tradition. Hawk Time participants entertained students on Read Across America day. Ms. Hubinger shows her 7th grade students how to draw a real life image. The Hawk of the Month program offered students in all grades rewards and incentives for positive behavior, and this spilled into more noticeable effort on state achievement tests. Strong technology and engineering, visual and performing arts, and gifted and talented instruction programs remained in place as shown through parent engagement evenings, public displays and performances, and student participation in competitions. In late spring the staff came together and made significant progress on schedule revision, the establishment of shared core values, goal setting, and the creation of a shared vision for the future of the school. In early June former Pueblo 60 principal Marne Autobee became Harrison's new principal for the 2017-18 school year. She brings more than a decade of successful experience as a K-8 building leader along with her. At the same time, former Mountain View Core Knowledge and Harrison K-8 teacher Garrett Olguin accepted the role of assistant principal. Each year at our All-Staff gathering the CCHS JROTC Color Guard kicks off the festivities. Last week we received the results of a structural study on the 1925 section of the Cañon City Middle School building. We had this work done to learn more about what is feasible regarding any possible future upgrade of the facility. Unfortunately, the results show any substantial remodel would require us to also conduct significant structural upgrades. We'll take this, as well as many other factors, into account as we determine a path toward improving the learning environment for Falcon students. Our back to school schedule has been solidified. New teacher orientation will take place from August 9th through August 14th. On Tuesday, August 15th, we'll welcome the rest of our staff back at a traditional morning gathering held at the high school auditorium. On Wednesday, August 16th elementary teachers have building level professional development in the morning and collaboration time in the afternoon. On that same day, there will be district guided professional development for high school staff in the morning and for middle school staff in the afternoon. On Thursday, August 17th elementary teachers once again have district guided professional development in the morning and collaboration time in the afternoon. Grade 6-12 teachers have building level professional development that entire day. Friday, August 18th has been set aside as a work day for instructional staff members to prepare their classrooms for the arrival of students. Monday, August 21st is the first day of students for grades K-9, except for CCMS who will entertain only 6th graders for a special orientation. This is a half school day with teachers having the afternoon to work in their classrooms once again. Tuesday, August 22nd is the first full day for all students in grades K-9. On Wednesday, August 23rd all students in grades K-12 will be in attendance. Last week I attended a board meeting and work session worked on developing a payroll deduction form staff members can use to support CCEOE, met with other superintendents about possible future changes to the school finance act, ensured we have communicated with the county clerk about our upcoming election, communicated our updated department duties matrix, worked on an all-staff gathering presentation, wrote a back to school article for the Daily Record, and took advantage of a little personal time off. Operations Director Jeff Peterson tugs on an emergency exit door, to no avail, at Cañon City Middle School. This week I'll peek in on our training of another 35 staff in Lindamood-Bell reading intervention processes. I have a meeting with directors about finance department matters. I'll also spend time with director of operations Jeff Peterson shooting video footage of building deficiencies at Washington Elementary and Cañon City Middle School. On Tuesday I'll make an appearance on Morning Line, attend a SAC meeting, and then travel to Denver for a Colorado Safe Schools Resource Center advisory board meeting. I have meetings scheduled with our warehouse staff, director of special services Lynnette Steinhoff, a parent of a Harrison student, and middle school counseling and administrative personnel. I'll also be working to gather more information on CCMS building improvement options and preparing for staff to return to work on August 15th.